In his first State of the Union address since his reelection, President Obama picked on some of the themes of his inaugural address: He called on Americans to recognize "certain obligations to one another," offering a vision in which government plays a crucial role in boosting the middle class and an appeal to economic fairness and shared sacrifice. He also sought to change the conversation in Washington, which has focused on bringing down the deficit and debt, with a call for spending on infrastructure and in other areas. "Let's be clear: Deficit reduction alone is not an economic plan," Mr. Obama said. "It's not a bigger government we need, but a smarter government that sets priorities and invests in broad-based growth." Yet while the president echoed some of the loftier rhetoric of his inaugural, he also followed tradition and used the State of the Union to lay out some specific proposals. And while Mr. Obama was occasionally vague - more on that shortly - he made the case that he had a series of concrete, ostensibly uncontroversial ideas that could move the country forward, if only Republicans in Congress will stop standing in the way. Let's take a look at the five key moments from the speech - and assess whether the president's words are likely to be followed up by concrete action. It was, the White House said, the most tweeted moment of the night: The president's call for Congress to increase the federal minimum wage from the current level of $7.25 up to $9 per hour. "Tonight, let's declare that, in the wealthiest nation on Earth, no one who works full time should have to live in poverty," said the president, who told the nation that a full time minimum-wage worker makes just $14,500 per year. The president wants the minimum wage to hit $9 by 2015 and then be tied to the cost of living in the future. First, a little context. The president actually called for a greater increase in the federal minimum wage in the past: As a candidate, he called for it to be increased to $9.50 per hour. It's also worth pointing out that Mitt Romney called for allowing the minimum wage to be tied to the cost of living, to the consternation of some conservatives, though he later suggested he did not support raising the minimum wage level. So are we likely to see Congress take up the president's call? It's not likely. The minimum wage was increased three times between 2007 and 2009, a period when the Democratic Party controlled Congress. It's no coincidence that it has not increased since Republicans took control of the House. The GOP has long been skeptical of increases in the minimum wage, which are generally opposed by business interests who complain that it means increased costs and potentially less hiring. There's little reason to believe that Republicans in the House will reverse course anytime soon. 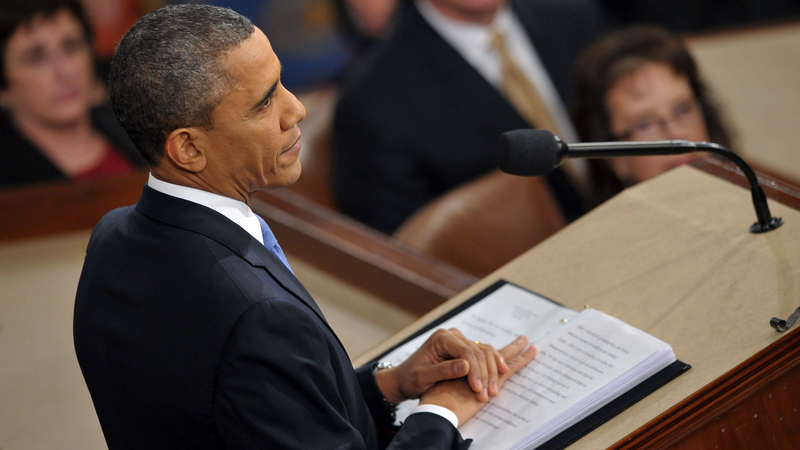 Here's another issue where the president's rhetoric is unlikely to spur action from Congress. As he did in his inaugural address, Mr. Obama made a forceful case for taking steps to address climate change, calling on Americans in the wake of superstorm Sandy and other intense weather events "to believe in the overwhelming judgment of science and act before it's too late." Mr. Obama asked Congress to pursue a "bipartisan, market-based solution," even invoking his onetime rival John McCain's past efforts on the issue. But he is well aware that many in Congress - including some of his fellow Democrats - have little appetite for climate change legislation, which critics said would hamper economic growth. At the start of his first term, Mr. Obama rallied support for a "cap-and-trade" plan that would allow polluters to trade permits for carbon emissions; it collapsed in the Senate in the middle of 2010, to the lingering disappointment of environmental activists. With Republicans in control of the House, a resurrection of the cap and trade bill is a non-starter, something Mr. Obama seemed to acknowledge Tuesday night when he said that "if Congress won't act soon to protect future generations, I will." What can he do? One step that the White House appears poised to pursue is curbing emissions from power plants; another is mandating increased energy efficiency for household appliances. He also plans to push for continued investment and research in cleaner energy, paid for in part via an "Energy Security Trust" funded by oil and gas revenues. It could, he claimed, help the nation achieve what even the most optimistic environmentalists would have to acknowledge is a lofty goal, at least in the short term: Shifting "cars and trucks off oil for good." One of the most emotional moments of Tuesday's speech came when Mr. Obama pointed to 102-year-old Floridian Desiline Victor, who had to wait for as long as six hours to vote in November. "And as time ticked by, her concern was not with her tired body or aching feet, but whether folks like her would get to have their say," said the president. The comment prompted a standing ovation and smiles from many in the audience, along with complaints online that House Speaker John Boehner, R-Ohio, was not among those standing up. So what is the president going to do about it? He's...forming a commission. "I'm asking two long-time experts in the field -- who, by the way, recently served as the top attorneys for my campaign and for Governor Romney's campaign -- to lead it," he said. "We can fix this. And we will. The American people demand it, and so does our democracy." As the president himself has acknowledged in the past, Washington commissions are places where ideas tend to languish. That's not to say that this commission won't issue concrete, useful recommendations, and some states may take them up. But the track record isn't great. Consider: After the 2000 election, the Election Assistance Commission was created to help run elections; as the Washington Post reported, by 2012 it was "totally leaderless," with all four commissioner spots empty and no executive director. This was the night's biggest emotional moment: Mr. Obama's invocation of 15-year-old Hadiya Pendleton, who was shot to death in Chicago - a mile from the president's house - a week after performing at his inauguration. Pendleton's parents were among the victims of gun violence in attendance Tuesday night, and he said they were among those who "deserve a vote" in Congress - a phrase he repeated six times while invoking Gabrielle Giffords, and the people of Newtown, Conn., and Aurora, Colo., along with others touched by gun violence. The president was emotional here, but he was also vague. He spent more time pointing to recent gun tragedies than he did articulating specific proposals. That is partly because his proposals are somewhat familiar at this point. But it also has to do with the fact that the president believes he can succeed in part by rallying the American people to his cause. He pressured lawmakers to acknowledge the fact that "more than a thousand birthdays, graduations, anniversaries have been stolen from our lives by a bullet from a gun" since Newtown by at least voting on something designed to stem the tide. Does that mean gun control legislation is imminent? Hardly. The assault weapons ban is almost certainly unlikely to pass, and even something like universal background checks - which more than nine in 10 Americans support - is no sure thing. But the president's appeal may well have helped efforts to keep the issue alive in the halls of Congress - and it's no small thing that Boehner was among those standing and clapping when Mr. Obama called for a vote. Among the most unexpected passages in the speech was the president's proposal to work "with states to make high-quality preschool available to every single child in America." He made the case within the context of his push for a more secure middle class, pointing to studies that show that in Georgia and Oklahoma, where which prioritize early childhood education, "students grow up more likely to read and do math at grade level, graduate high school, hold a job, form more stable families of their own." The president didn't stop there, either: He also called for a shift to more vocational training for high school students, with a particular focus on high-tech areas like computers and engineering. He compared the American education system unfavorably to Germany, where there is a "focus on graduating their high school students with the equivalent of a technical degree from one of our community colleges." He also called for colleges to help keep costs down so that students do not graduate with crippling debt. On this last issue, he had a concrete proposal: For Congress to pass the Higher Education Act, which tied federal aid for colleges to affordability and value. On the other issues, however, the president seemed largely to be trying to push a national conversation. For high schools, he said merely that he was "announcing a new challenge" for them to better prepare students for the high-tech sector. It may not translate to direct federal action, but for education reformers it did mean a welcome spotlight that could help kick start more innovation at the state and local level.